I met C.S. Jennings through his very fun and lively twitter feed. Get ready for great images and helpful advice (on production tasks too) to follow. Enjoy! C.S. 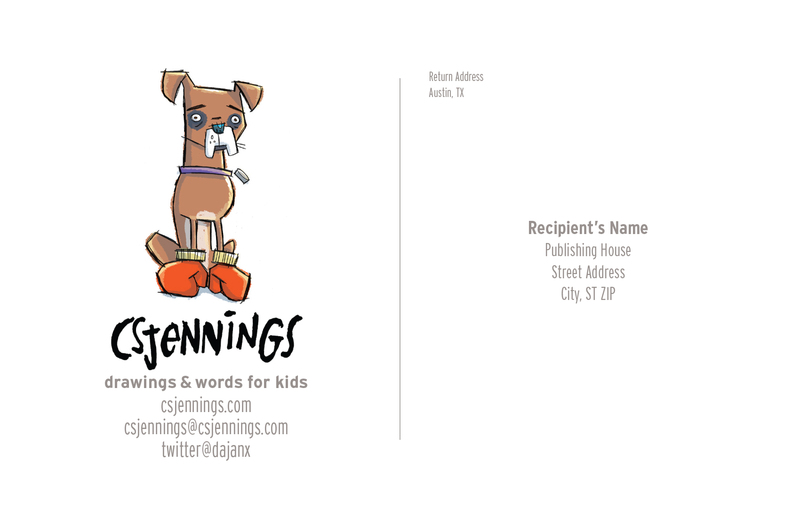 Jennings is a professional illustrator and sometimes author specializing in concept work, children’s, and editorial illustration. He is the author of ANIMAL BAND and HELLO, TEXAS! He is the illustrator of his picture book ANIMAL BAND, Dial Books for Young Reader’s JACOB WONDERBAR chapter books by Nathan Bransford, Capstone’s THE INCREDIBLE ROCKHEAD graphic novel series by Scott Nickel, and A SERIOUS CASE OF THE SILLIES, published by Scholastic. First, the drawing has to make me smile or laugh. I think images with emotional connection have the most impact. Next, I imagine it tacked to a wall, so the image needs to read from five feet or so. Also, it will echo the kind of work I want. I’ve recently done lots of chapter book work, so my postcards now carry my picture book techniques. this postcard originally had text on top. 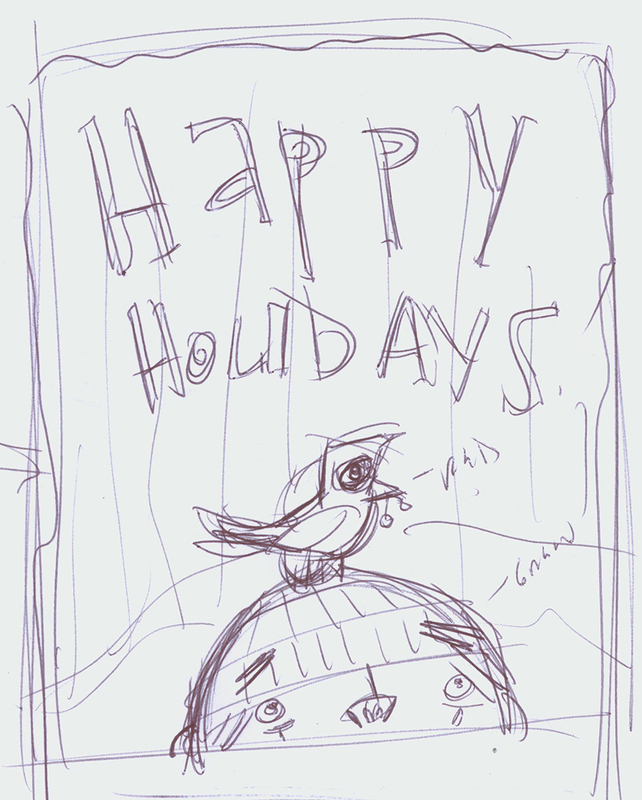 Once the drawing was done, the image wanted to be the star, so the text was pulled. The back of this postcard is a real knock out (pun intended). Great use of type and image! Not really. I’ve always got several drawings I am working on, from rough to almost final. I pull from those as they represent my newest ideas and techniques. Some illustrators create a series of postcards and send them out over time. Do you create a series or stand-alone images? 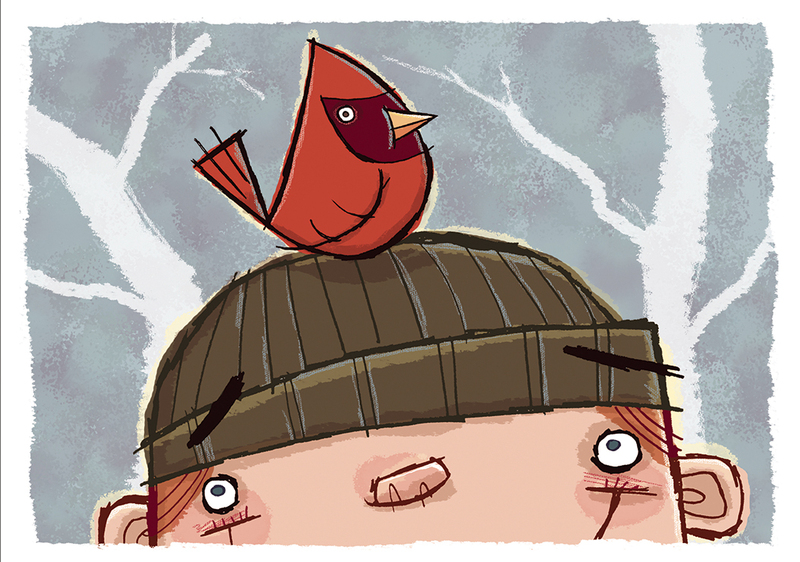 I don’t do series postcards. But—haha—that’s such a cool idea. * If I were doing a series I think it would be important to build in as much character and setting variety as I could. *Thanks! You’ll have to come back and show us if you do a series, OK? I send them four times a year. *Great advice! So much to learn in these situations. Any tips on keeping a list and sending out? I use the same methods most people do in gathering that information–THE CHILDREN’S WRITER’S AND ILLUSTRATOR’S MARKET and SCBWI’s (I am a member)* THE BOOK. I also peruse the children’s magazine and book sections of bookstores looking for publications where my style will fit. With the magazine, I take a shot of the addresses on the publisher’s information page with my phone, or I just buy the magazine. To manage my list, I use Excel and import the addresses into Indesign utilizing its variable data capabilities. *Me too. Great organization and THE BOOK is a big help. *Wow! I hope everyone is printing out all that concise, important info. 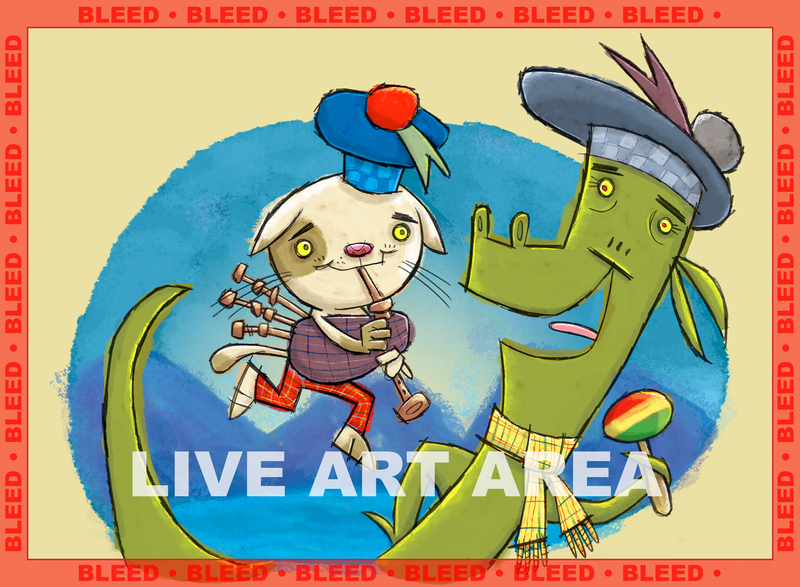 Great visual explanation of bleed and live art areas. I use a local print shop I have a relationship with. I like the ability to work directly with a person to be sure I get the results I expect. Plus, I get to handle the papers (I am a paper nerd)* and talk through all the options with them. In the end, they are cheaper than when I have had my cards quoted online and I get a great product every time (and if I didn’t, I have a person to go to). *I have to admit I like to feel paper too. Paper Nerds Unite! A big THANK YOU to C.S. for a very informative and inspiring interview! You can see more of C.S. Jennings’ work at the links below. I highly recommend that you do. *I know! I really loved your tweet on “99 strange collective animal names”! Lots of important stuff going on on twitter. Hooray for Kristine Carlson Asselin! Great interview! Love that you use local print shops. That’s the way to do it! YEAH! Buy local. Loved learning your process, C.S. The early sketch and final was a lot of fun to watch. Thanks! Great advice! Thanks for sharing, C.S. !